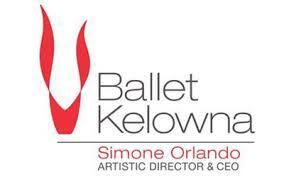 World premieres in Kelowna. They were super suite. On the first Thursday of May, Kelowna Community Theatre was the gracious host site of several world premieres all neatly choreographed and composed into a visual parade of ballet and music. 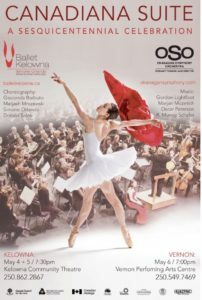 On this balmy eve in front of a packed house, Ballet Kelowna and the Okanagan Symphony Orchestra (OSO) joined forces to present Canadiana Suite: A Sesquicentennial Celebration and tribute performance in honor of Canada’s 150th anniversary. Yeah, it was that gosh-darn good. “Superb” said wife Elaine at final curtain call. I heard a woman sitting behind us enthusiastically gush “that was absolutely beautiful.” Total appreciation and enjoyment was the common thread for the two-and-a-half-hour show. Combining ballet dancers and superb musicians on one stage was quite an undertaking that showcased Canada’s rich history and cultural diversity. Kudos to all who had to have worked tirelessly behind the scenes to deliver such a stellar production. Thank goodness there was a program (with detailed program notes) made available to all attendees. It pointed out the evening’s guest artists – the Neville Bowman Trio and soloists Shakura S’Aida and Neville Bowman. It outlined every musical number and the choreographer and composer of each number. Best of all, it alerted us as to which performances were world premieres. The first world premiere was Unfolding, choreography by Matjash Mrozewski and music by Marjan Mozetich, Postcards from the Sky. The second was Elephant in a Room, choreography by Donald Sales and music by Nina Simone and Oscar Peterson. The third was Eight and Sand, choreography by Gioconda Barbuto and music by Gordon Lightfoot, Canadian Railroad Trilogy. The fourth and final world premiere was Canadiana Suite, choreography by Simone Orlando and Donald Sales, music by Oscar Peterson. 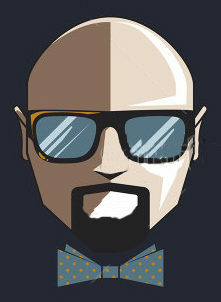 The was so much song and dance packed into one masterpiece that it was hard to cover all the bases. My favorite part of the show was the high-energy Canadiana Suite and Hymn to Freedom. These compositions were peppered with lively music and had the brilliant ballet dancers in colorful costumes cavorting around like they were having a ball. I kinda got (don’t laugh) a Westside Story vibe from parts of it. Maybe because the female dancers were in frilly dresses and they seemed to be teasing and egging on their male counterparts. According to OSO Music Director Rosemary Thomson, Canadiana Suite, which was originally composed by Peterson for jazz trio, premiered this evening as a new orchestral arrangement written by Peterson‘s friend and producer, Lance Anderson, in a commission by the OSO. Not lost in all the revelry, the OSO never sounded better. Well done by Thomson to whip her troops into shape for this challenging assortment of original and classic sounds. The OSO is finishing up a stellar season of showcase performances. Big Finish – before the show I was wondering how they were gonna fit the entire OSO on stage and have room for the ballet dancers?! In a brilliant engineering feat, the OSO was stacked on three tiers (like a metal wedding cake) at the back end of the stage. That left the front half open for the Ballet Kelowna dancers who were absolutely on fire all night.